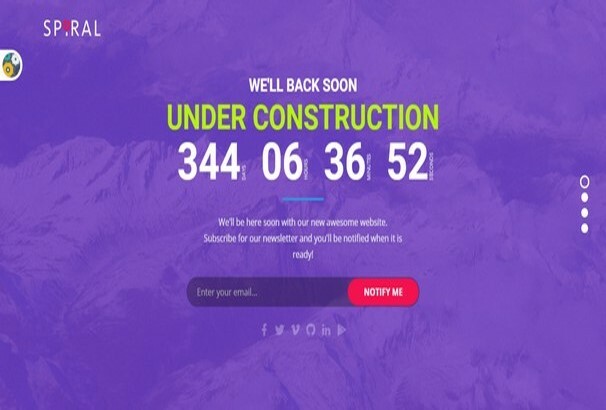 If you are in the process of launching a new website or have closed your site for a redesign, putting up a “coming soon” or “under construction” page is a great way to keep any people who visit your site informed about the work. 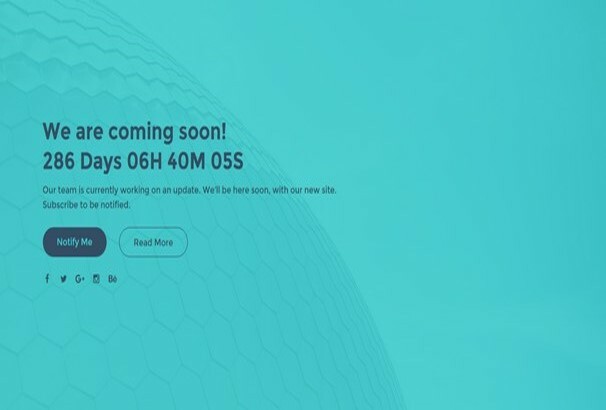 You can inform them when the new site will be going live and you can use the page to collect emails or link out to your social media profiles so you can inform them when you launch. 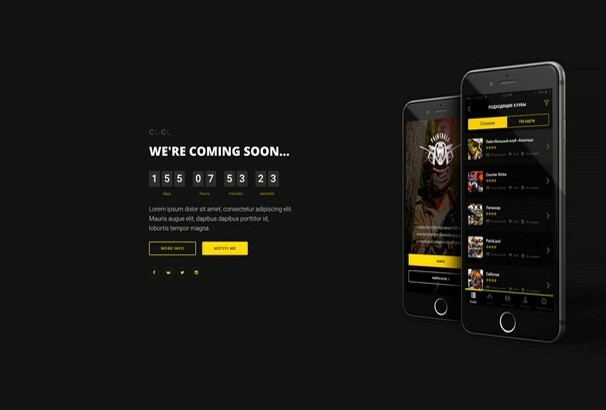 A good coming soon page will be branded to match your new site, using the same colors, fonts and your logo. 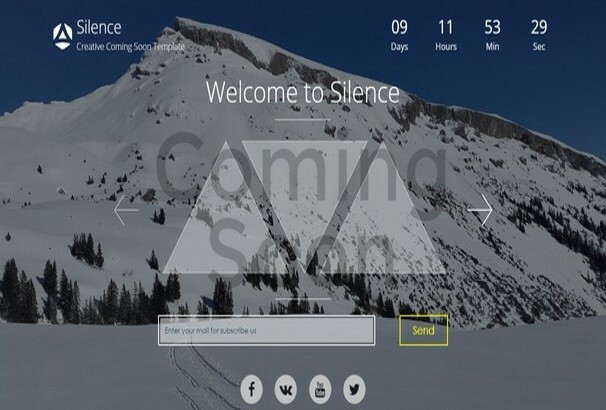 You can include a countdown timer to the date and time of the website launch to help build anticipation and you can include some text explaining about your company or service. The most important thing to include though is undoubtedly the email collection box, by gathering up emails of interested parties you can send out an email at launch to get al all-important boost to your new website. 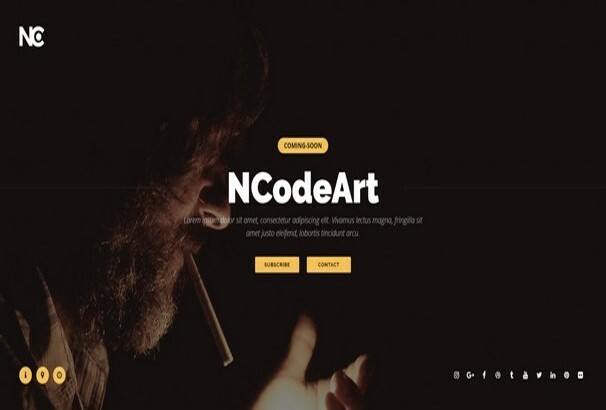 This collection contains over 50 HTML Coming Soon Templates which you can download and quickly create your holding page, tweak the colors, layout and branding as you see fit so you can get on with finishing off your new website. A Static HTML page is fine, but if you prefer something more advanced, you can take a look at our collection of WordPress Coming Soon Themes also. Coco is a beautifully designed responsive under construction coming soon templates with over 500+ HTML files and 250 design variations. 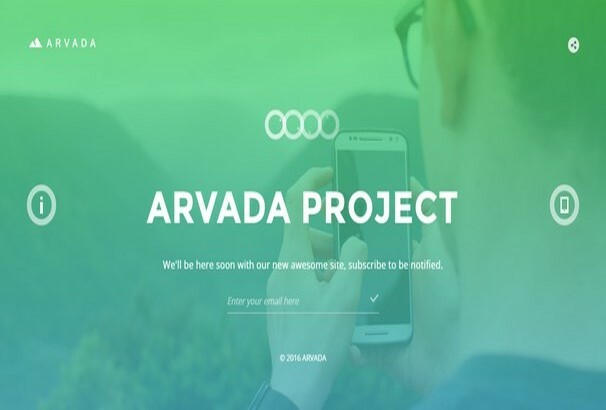 This template is a great one to tell people about your upcoming project with a beautiful Coming Soon page. This is a multi-purpose, customizable and responsive coming soon HTML 5 template that comes with a minimalistic design. The template also offers an AJAX powered working contact form that can be used for your visitors to contact you. Try out the Spark Coming Soon template for your new project. 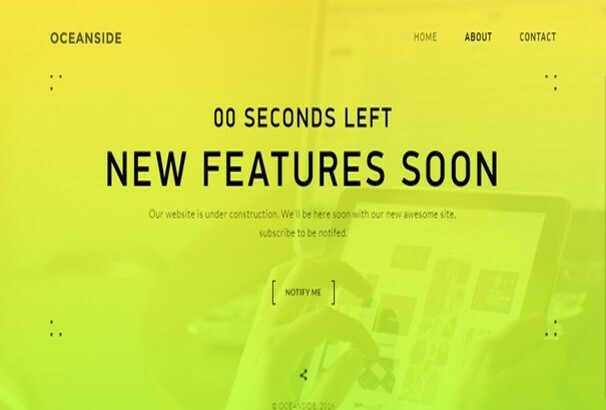 It is a light user-friendly Coming Soon and Under Construction template based on Bootstrap with an inbuilt countdown timer. 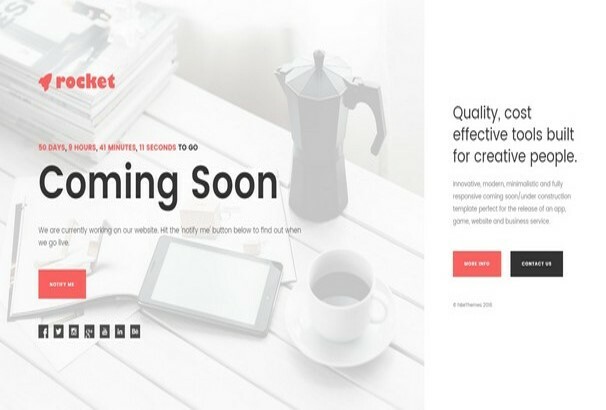 This is yet another modern, clean and creative Coming Soon template with 12 unique variations suitable for any website/blog that is getting built or is under construction. Lucid is a simple yet modern, minimalistic, fully responsive Coming Soon HTML template that supports multiple devices with any screen resolution. It includes tons of advanced features like a countdown timer, email notifier, different types of portfolios and services. 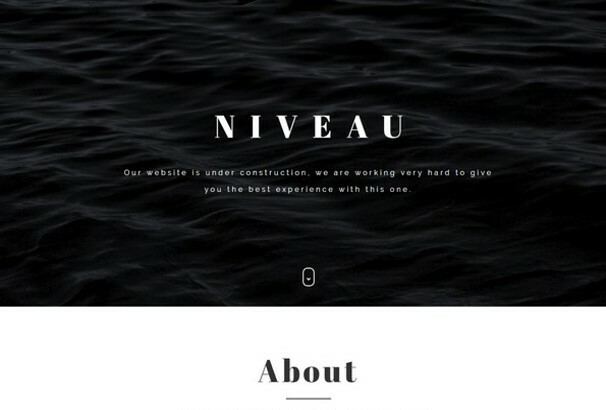 Driven by modern technologies like Angular JS,HTML5, CSS3, Niveau comes with a clean, minimalistic design. It is an easily customizable template that provides2 types of pages: static background and slideshow background. Fully functional with MailChimp subscription form and Ajax Contact form. With over 35 unique Home Pages, JustWait is clean template based on BootStrap 3.3.6 Framework. It can be easily customized and contains integrated MailChimp, working contact form, Google Fonts and lot more. 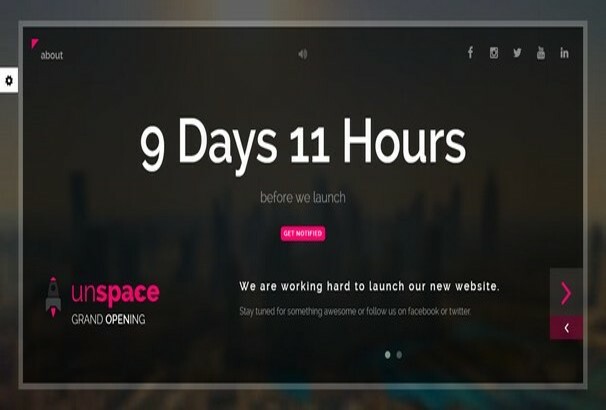 Unspace is a responsive, multi purpose, easy customizable HTML5 template that come with a Clean design with unique flip effects. 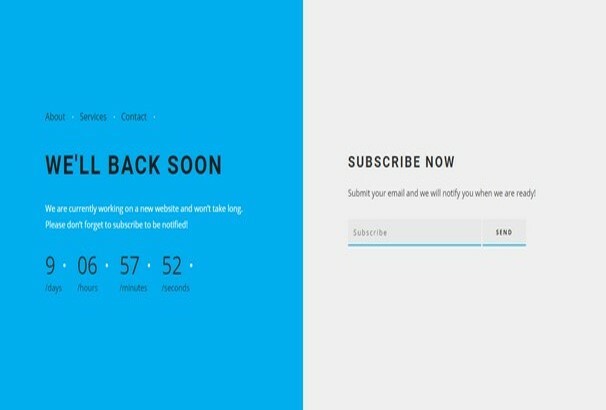 Unscape contains a jQuery countdown , integrated MailChimp and AJAX Subscription Form and lot more. 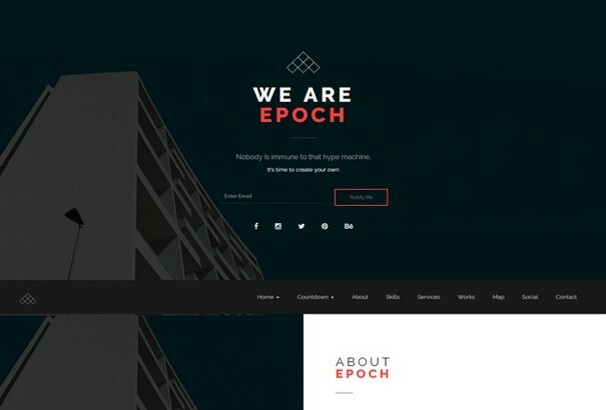 With 12 background designs, 2 different homepage versions, Epoch is suitable for any Corporate, Creative or business agencies. It is based on modern technologies like HTML5, CSS3, Bootstrap and Uikit. The template is amazingly SEO friendly and allows YouTube Video to be used as background. 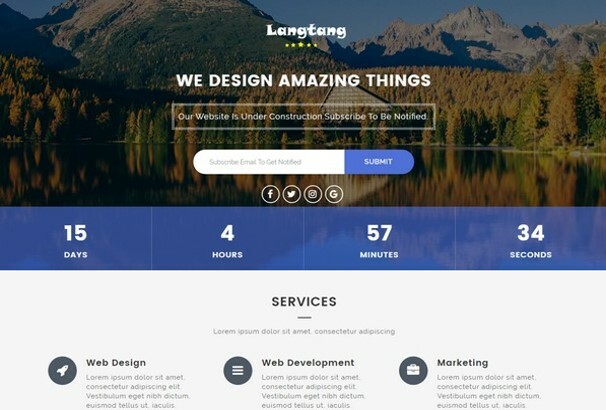 This is a well-built, fully responsive, Bootstrap 3 based template with over 1000+ fonts, 9 background styles, AJAX subscription form and many more. 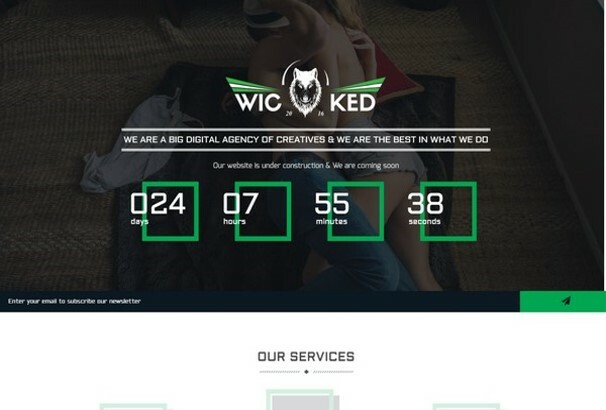 Wicked is an innovative theme ideal for any coming soon/constructive website. 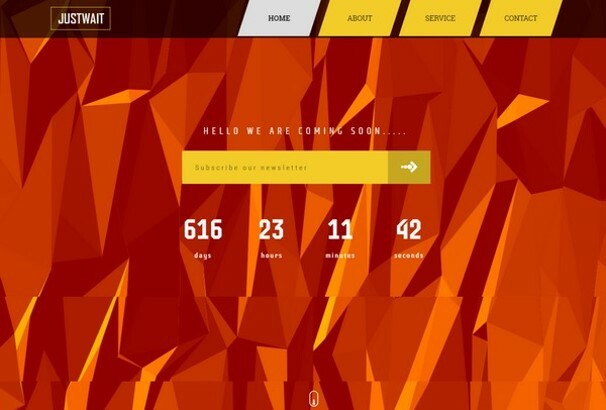 Included in this theme are a working AJAX contact and subscription form, Google fonts, countdown timer and many more. It has 7 layout variations and 28 color schemes.With its creative particle effect and 320+ retina ready theme icons, Bruise is one of the best coming soon templates for your website /blog. A well-documented, modern, fully responsive, cross browser compatible template suitable for any corporate, creative or business agencies. It has 6 amazing demo variants with AJAX subscription form, integrated MailChimp, custom backgrounds and many other eye catching features. Pixos is a clean, minimal design template. It is easy to customize, has CSS3 animations with 24 background styles like Background animation, Cloud animation, Rain and Fog animation, etc. Includes AJAX email form, working contact form, well documented HTML and CSS files with many more features in their way. Built with HMTL5 and CSS3 , Tripaco is a responsive template that comes with working contact form (AJAX based), subscription form with MailChimp integration. It includes a Full-page slider, parallax scrolling, material-design iconic fonts, 9 different pages, free support and many more. 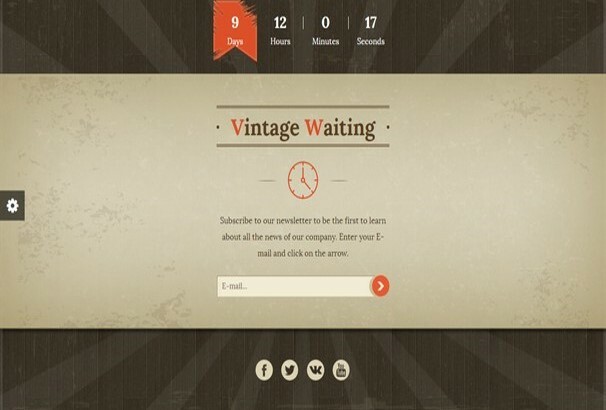 A clean, multi-purpose template that gives your website a 2 column based vintage style. It is 100% responsive, has 2 HTML versions, Grid flexible, easy to install and customize. It, however, is not a high resolution template. 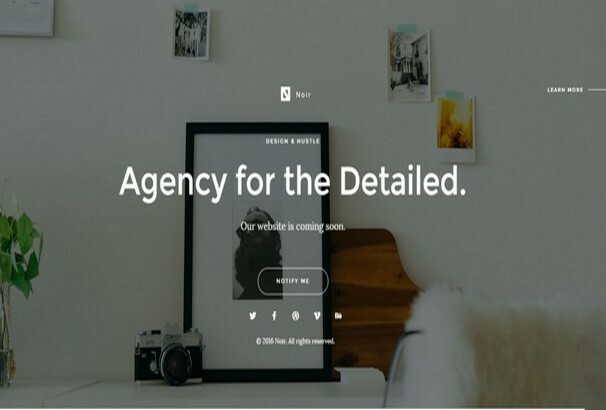 Leon is a creative, modern template based on Bootstrap 3. It comes with 4 home styles, 10 background styles-image backgrounds, 3 button styles, LightBox gallery,22 HTML template designs. It has integrated the option of MailChimp with AJAX Subscription form and working contact form. 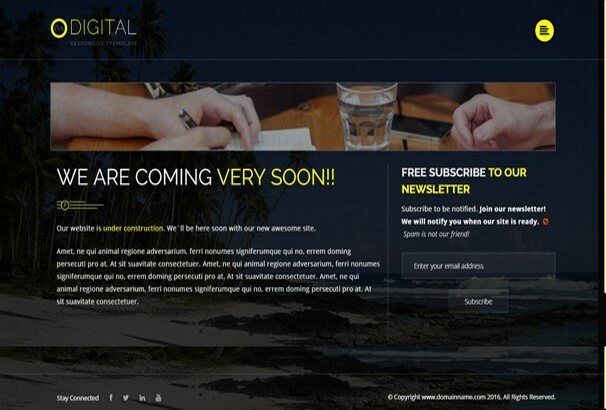 A modern Coming soon 4 column template suitable for any business or other agencies that is under construction. It is well documented and includes 4 combined pages, navigation section page, retina ready graphics and icons, professionally crafted UI elements, contact form with HTML5 validation. 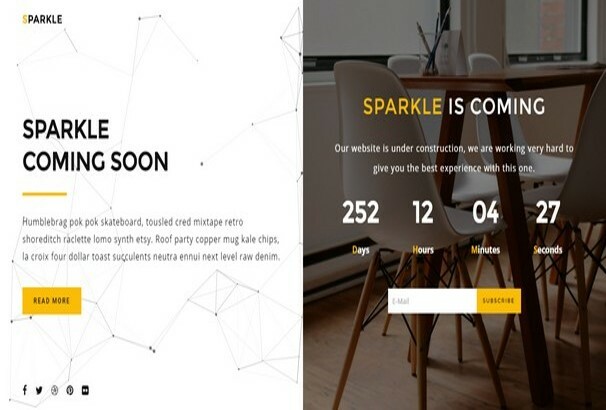 Sparkle is a simple, conceptual coming soon template with a unique design that is suited for any kinds of projects. It is fully functional with MailChimp integration, AJAX contact form, subscription form. The template offers a 2 column layout that supports high resolution. 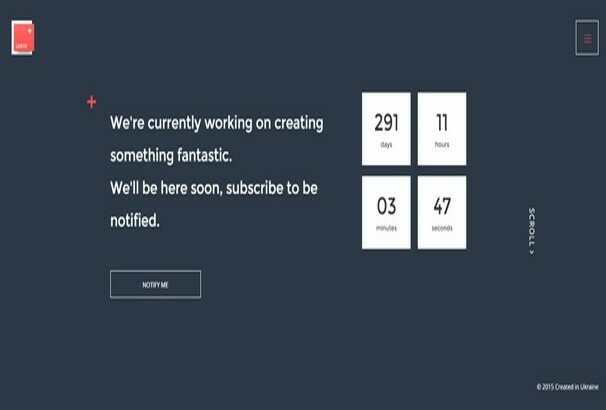 With 20+ color variations, Countdown timers, working Ajax subscription forms, Tooman is a fully responsive modern under construction template. 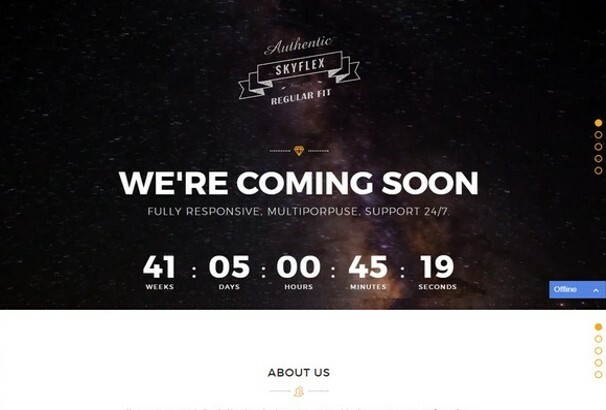 Skyflex is a responsive template with a universal design, ideal for building personal or business websites. It comes with 5 different versions – image, slideshow, particle, HTML5 video background and video background. It includes a variety of JQuery plugins along with user-friendly contact forms with high resolution. 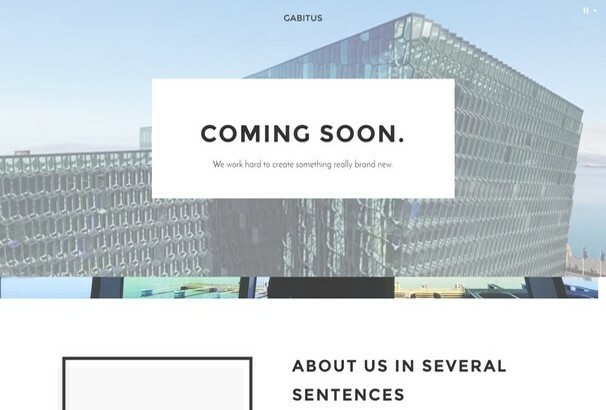 This is a clean, uniquely designed template based on Bootstrap Grid system. It is 100% responsive and is cross-browser compatible. It has 10 cool amazing demo variants with AJAX subscription form, custom backgrounds, integrated MailChimp and several other features. 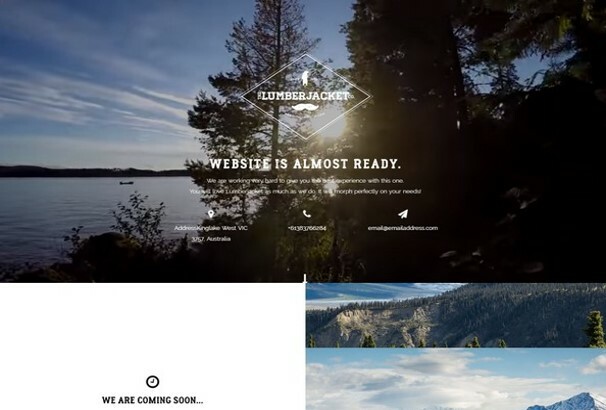 Lakes is a fully responsive template made with Bootstrap 3, HTML5, CSS3 and JQuery. It includes AJAX forms with working validation, portfolio section, various effects and a collection of awesome fonts that make it suitable for any needs: creatives, agencies, corporates, etc. 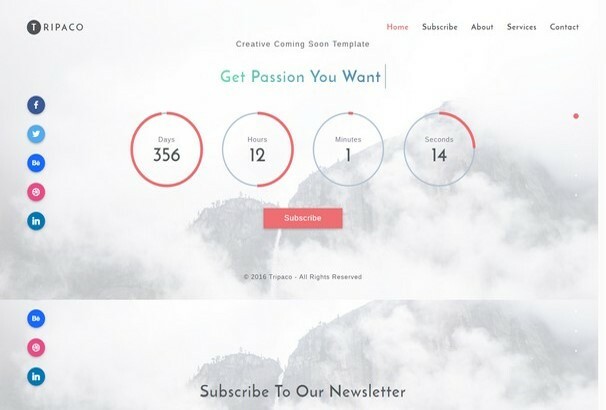 Instant is an elegant, versatile coming soon template with various features like Ajax Contact/subscription form, multiple backgrounds, smooth transition effects. 1300+ font icons, etc. It includes MailChimp, GetResponse, Campaign Monitor integration and offline mode email listing feature. A modern template suitable for any scope like corporate, intro pages, product launch promos and almost everything else. This template includes integrated MailChimp, PSD files, Ajax Subscription form, awesome font collection, custom backgrounds and much more. A multi purpose coming soon templates with various stunning designs and over 700+ icons. It is truly responsive with features such as AJAX contact form, LightBox gallery, MailChimp Integration, portfolio galleries, 3D Parallax layouts and many others. OceanSide is a creative, professional and responsive coming soon template that is perfectly displayed in all window sizes. This template includes 6 background styles, retina ready, CSS3 animations, jQuery countdowns, Google maps integrated with full SASS support. 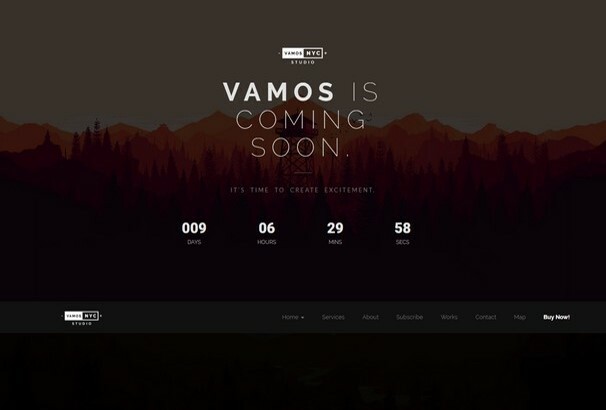 Vamos is a minimal, creative template with a unique and neat design based on Bootstrap 3 and Uikit. The template is Easily customizable. Its features include 1000+ icons, Google map, MailChimp, jQuery Countdown, Cross-browser compatible, SEO-friendly, contact-form validation and much more. 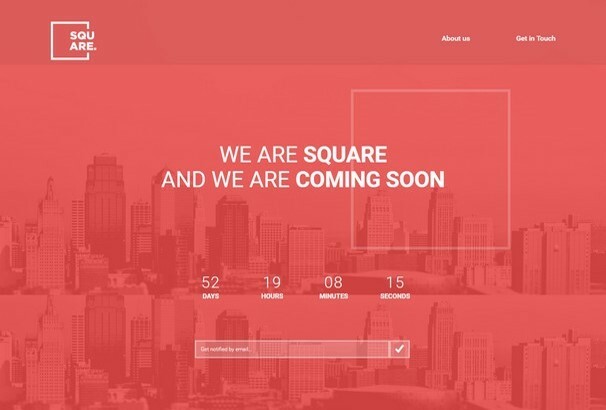 Square is a modern and clean under construction template with pixel perfect layout to provide stunning looks to your website. It is a responsive and fully adaptive template with 6 ready demos, video background, Ionicons Premium Icon font, Ajax contact form, MailChimp integration, unlimited color options and much more. 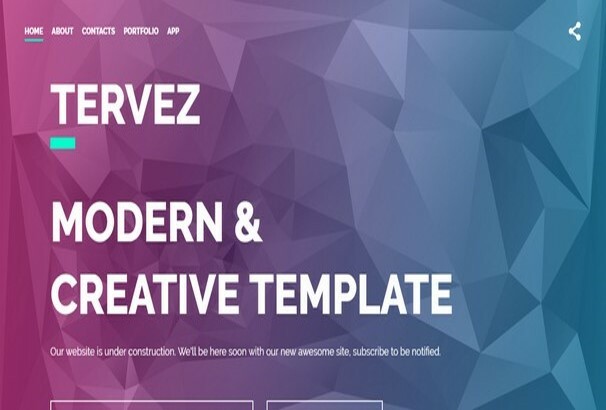 This is a creative, modern and professional template with tons of amazing features like CSS3 animations, 6 style themes, additional content pages, well documented and thorough responsiveness and much more. 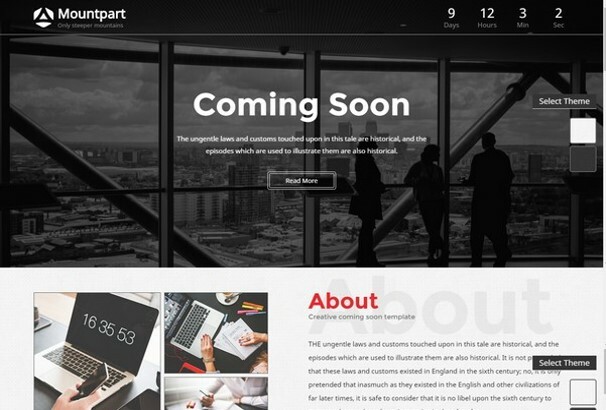 A fully responsive Coming Soon template based on Bootstrap 3. It provides multi-browser support, slideshow and video backgrounds, Google Web fonts, HTML5 and CSS3 animations and retina ready icons. 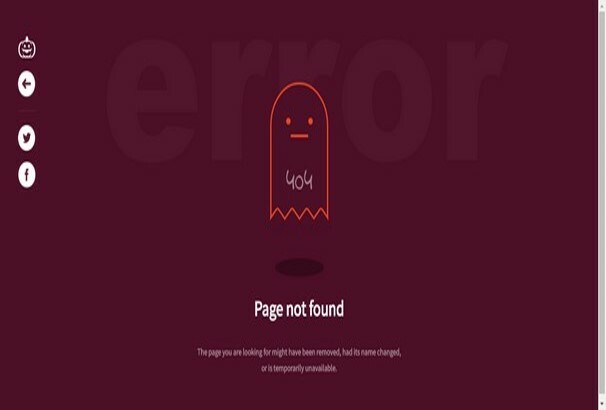 Halloween is a premium, stylish 404 and maintenance template with stunning animations and great features. It is easy to customize and is well documented with Font-Face integration. The template is compatible with social platforms, Bootstrap 3 and Foundation 6. This is a multi purpose coming soon template that uses HTML5 and CSS3 technologies. Its features include- MailChimp integration, AJAX contact forms, carousel text slider, fade in CSS3 animations, responsive layout, Google fonts and more. Wind is a responsive, multi-purpose, clean designed template suitable for business agencies, mobile application and websites. This template has 40 versions, SASS sources, CSS3 animations, working AJAX forms, SEO-friendly, cross browser compatible and such other features. 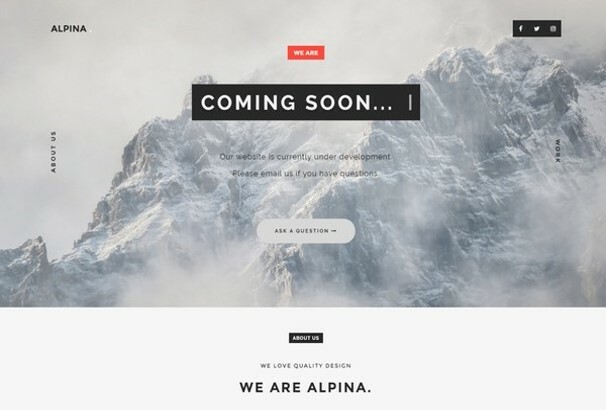 Alpina is a minimalistic and clean design template that provides 2 types of pages- Color and Black&White. This template is fully functional, providing MailChimp Subscription form and AJAX contact form, with 600+ icons and lightbox portfolio. MN is a simple, responsive, minimal coming soon template based on Bootstrap 3. It offers a trendy 2 look with awesome animations and beautiful fonts. This theme has PHP contact and Subscribe form, portfolio features and a lot more. Soon is a beautiful, responsive template based on Bootstrap3. 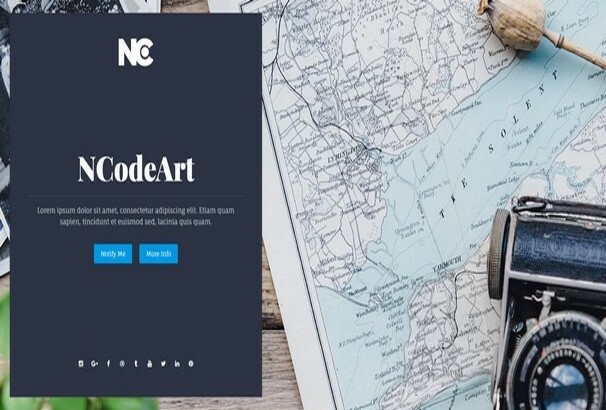 This theme includes 18 homepage variations, MailChimp Integrations, various effects, zoom animations, triangle generator and also different sections like About us, Portfolio/works, Services and contact with Map. 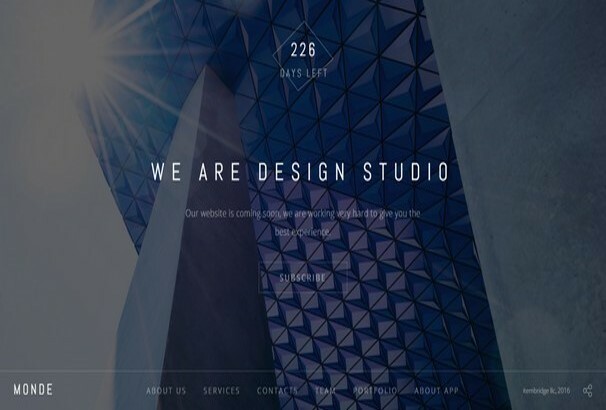 Cohen is a premium under construction template based on bootstrap 3. It has 20 style variations, background effects, 5 content pages, 3 columns, text rotator, jQuery and CSS3 animations effects, integrated MailChimp and so on. Hello is a modern, well-crafted, responsive template with a clean modern layout. 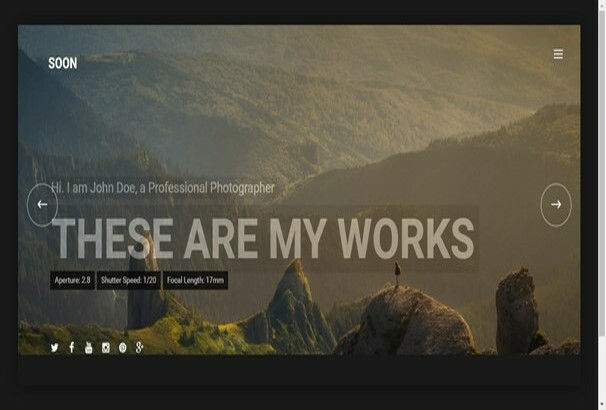 This template is based on HTML5, CSS3 and BootStrap3. It contains dynamic PHP contact form, google fonts and a countdown timer among others. Show is a simple, elegant, versatile template that comes with different versions and ready demo. It has many features like slideshow background, YouTube video background, AJAX form, countdown timers, MailChimp integration and many more feature. 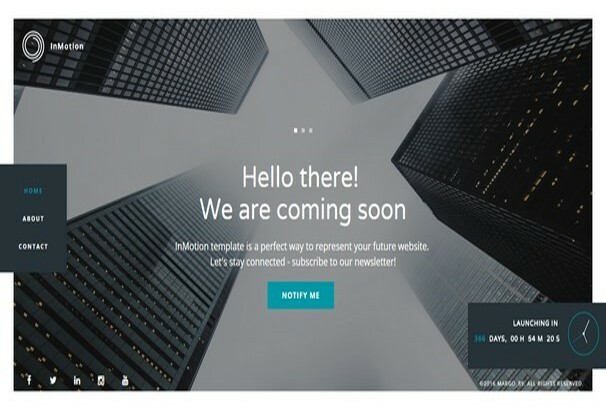 InMotion is an animated, fully responsive coming soon template with AJAX subscription and contact form. It is based on Bootstrap 3, HTML5, CSS3 with integrated MailChimp. This theme is mobile friendly and has a unique ‘pulsing’ navigation. 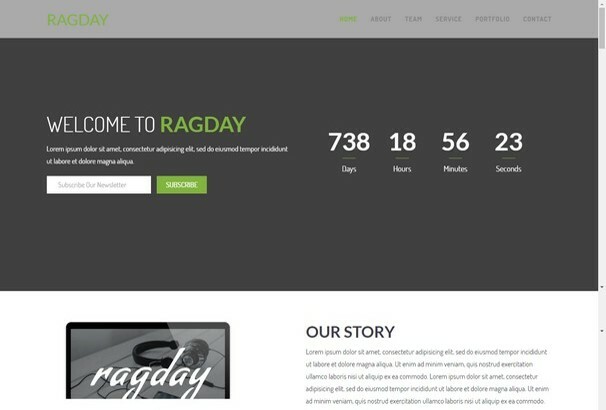 Ragday is a simple, multi-purpose template that is compatible with all devices. Clearly documented for easy customization with integrated Google maps, integrated MailChimp, is Console error free, has Ajax subscription form and integrated YouTube video. 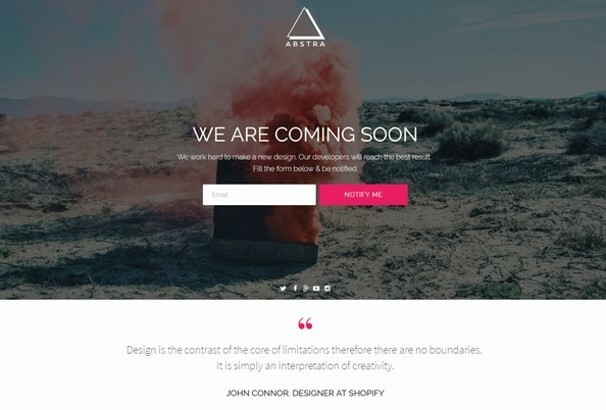 Aera is a responsive, bootstrap3 based, creative under construction template with AJAX subscription and contact form. It is easy to customize and is well documented. Porky is a modern, creative, HTML5 based template that comes with 10 different background styles. This theme is driven by modern technologies like Angular JS, CSS3, Bootstrap Sass. Includes effects like Typewriter text effect and Angular JS forms. Fully functional with integrated MailChimp. 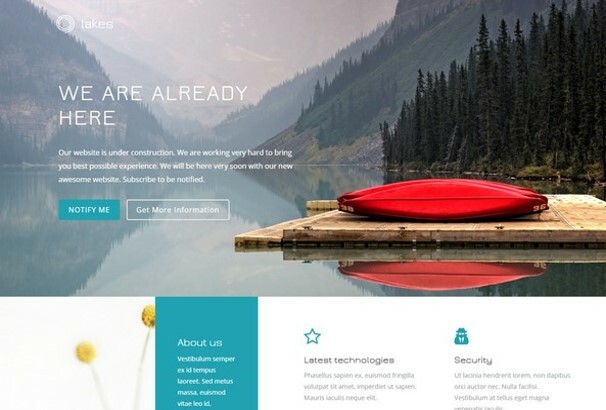 This is a custom designed, multifunctional HTML template based on Bootstrap. It uses the latest CSS3 animations. Contains retina ready, 6 demo versions, additional content pages, jQuery countdowns and extensive HTML documentation. A minimal, HTML5/CSS3 optimized, retina ready template, Xmas is ideal for landing/coming soon pages. The template is fully responsive with high-resolution support. It is Cross-browser compatible with integrated MailChimp with various animated effects. 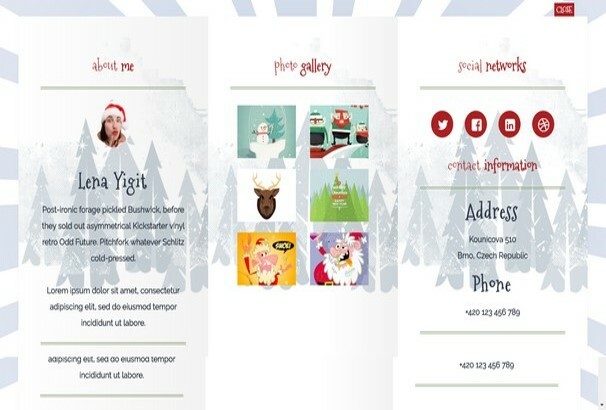 A modern template based on Christmas theme, suitable for promoting website before Christmas. 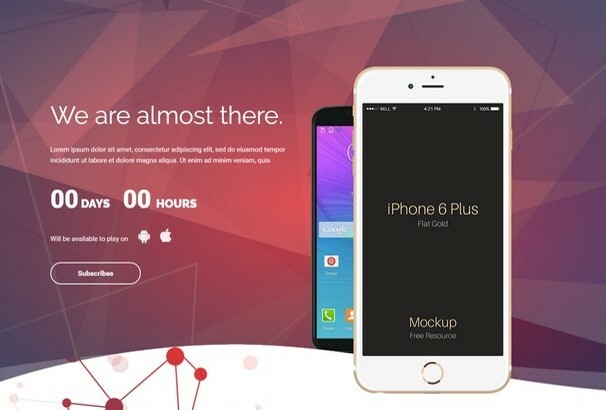 This template contains timer with added music, 6 different versions, responsive layout, full-screen image background and many others. Built using the latest Twitter Bootstrap3 framework, this template is easy to set-up and customize. It has 6 background styles, CSS3 animations, SASS, working contact and subscribe form, Google maps integrated, well documentation and 2 additional content pages. 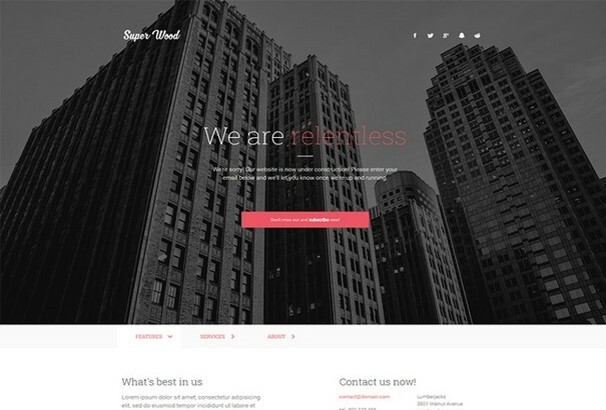 Super Wood is a minimal, responsive coming soon HTML5 template based on Bootstrap 3. This easily customizable template includes unique style, 500+ Font Awesome icons, custom animations and much more!